In the 1970s a movement was taking place in Berkley, California that would spread around the world. Members of the Center for Independent Living conducted a clandestine mission to pour their own concrete and created a ramp providing handicap access to the sidewalk. At the time, people in wheelchairs would have to either try and jump the curb or seek out driveways further down the street and enter the sidewalk from there. The ordinary act of crossing the street meant rolling out into the road and traveling in the street until you could find another place to enter, all the while avoiding any vehicles. What they wanted was equal access to the sidewalk just like everyone else. They continued to push and in 1972 won improved access. Their advocacy led to what we see around the world today as curb cuts - the angled ramps at key crossing points such as intersections. Initially the curb cut was intended for, and expected to be used solely by, people in wheelchairs. What happened however, was a far different result – everyone used them. It was easier now for the elderly to get onto the sidewalks, for parents pushing strollers, delivery persons pushing/pulling goods, runners, etc. This became known as the “curb- cut effect” - the idea that you design something with the disabled in mind but other groups end up benefiting as well. The curb-cut effect can also be seen with television closed captioning. While initially intended just for the hearing impaired, a wider audience was found to use it in noisy bars, airport terminals, or other places where the sound of a television couldn’t be heard but could now be read. It also became useful for comprehension where someone is watching a show not in his or her native language. Initially some of these efforts were grouped together as Barrier-free Design, which was like a patchwork quilt of legislation and movements to improve access to buildings & services. With time, planners & designers realized that a more comprehensive approach would be more efficient, better looking, and would cost less money. This was the beginning of Universal Design. 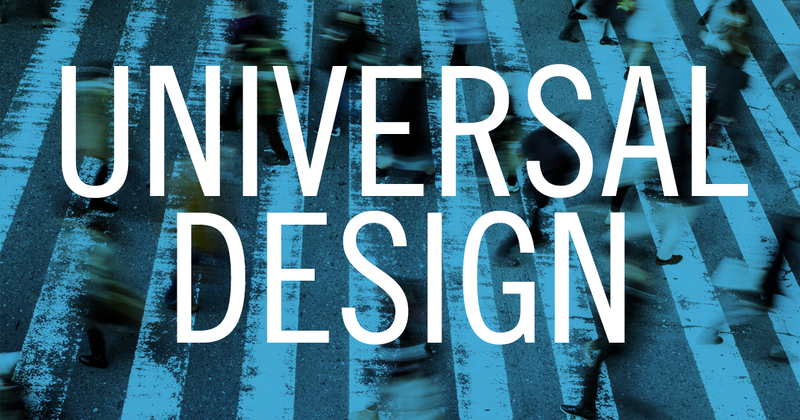 Universal Design recognizes that through medical advancements, shifting demographics, and just a sense of fairness, an increasing percentage of the population can benefit from improved access to products, services, and environments. The field of architecture is probably the easiest example of this. Stairs, railings, ramps, elevators, adequate lighting, etc. are all considered from the beginning of a project and not tacked on at the end. The world of user experience design has approached Universal Design by better formatting content for screen-readers and other tools to help users who need additional assistance navigating content. By designing & formatting content to work for users with more limited abilities, they are by default creating solutions that will work for most users. Most of the more sophisticated solutions to assure the greatest level of accessibility require more technical implementations. However, I will mention some easy and simple changes you can address. • For users who need content to be larger, Qlik Sense smartly allows you to expand any object to be full-screen. For any Sense apps viewed in a browser window users can take advantage of the browser’s native ability to zoom in on content. • Color blindness, specifically red-green color blindness, affects around 8% of men and 0.5% of women (depending on which stats you follow). Red-green color blindness is where the colors of red and green shift to look more like yellows and browns. Since many people like to color code their KPIs and other performance data as red for bad and green for good, this becomes a problem for people who won’t see that message and instead may see two colors that are nearly identical. Consider only color coding bad performance as red and leave good data colored the same as the rest of your text (a dark gray or black). • An additional consideration is visual contrast. With very subtle colors, it can be hard to see the difference between them. Choose colors that have enough contrast between them to make them easier to see. How much contrast is a bit of a judgement call but you can try looking at them on a very bright monitor and see if they become too washed out. Thinking of the curb-cut effect, when you design an application with accessibility in mind you help widen the range of possible users. The more people who can use your application means the more people you empower.